Moreover yet, from clinical practice, we know that depending on patient age, surface area, disease duration, and comorbidities an empiric treatment algorithm can be designed that is successful in a significant proportion of patients [Figure 1]. Ramot Y. 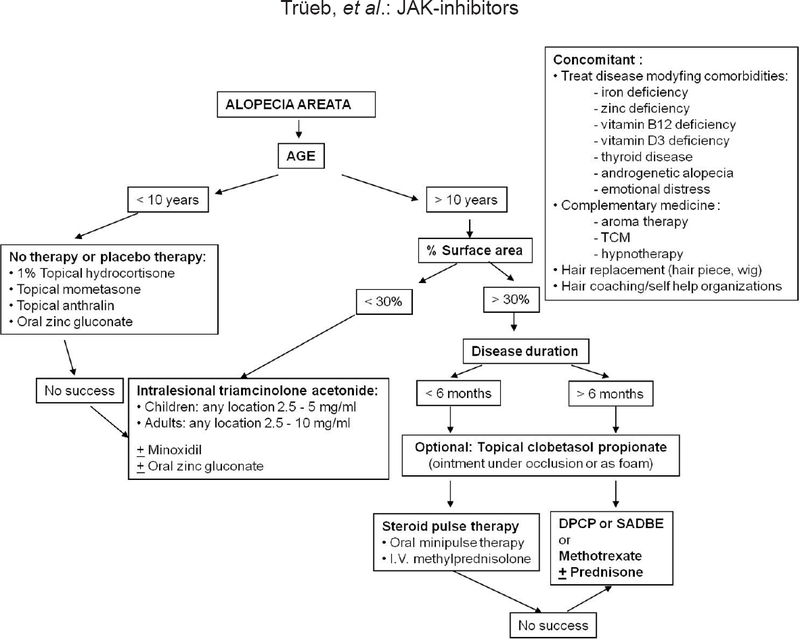 The Fascinating Story of how JAK Inhibitors Became the Drug of Choice for alopecia Areata. 18th Meeting of the European Hair Research Society, Bologna, Italy; 2018. Muller SA, Winkelmann RK. Alopecia areata. An evaluation of 736 patients. Arch Dermatol 1963;88:290-7. Finner AM. Alopecia areata: Clinical presentation, diagnosis, and unusual cases. Dermatol Ther 2011;24:348-54. Tosti A, Bellavista S, Iorizzo M. Alopecia areata: A long term follow-up study of 191 patients. J Am Acad Dermatol 2006;55:438-41. De Waard-van der Spek FB, Oranje AP, De Raeymaecker DM, Peereboom-Wynia JD. Juvenile versus maturity-onset alopecia areata – A comparative retrospective clinical study. Clin Exp Dermatol 1989;14:429-33. Barahmani N, Schabath MB, Duvic M, National Alopecia Areata Registry. History of atopy or autoimmunity increases risk of alopecia areata. J Am Acad Dermatol 2009;61:581-91. Yang S, Yang J, Liu JB, Wang HY, Yang Q, Gao M, et al. The genetic epidemiology of alopecia areata in China. Br J Dermatol 2004;151:16-23. Goh C, Finkel M, Christos PJ, Sinha AA. Profile of 513 patients with alopecia areata: Associations of disease subtypes with atopy, autoimmune disease and positive family history. J Eur Acad Dermatol Venereol 2006;20:1055-60. Lew BL, Shin MK, Sim WY. Acute diffuse and total alopecia: A new subtype of alopecia areata with a favorable prognosis. J Am Acad Dermatol 2009;60:85-93. Abell E, Munro DD. Intralesional treatment of alopecia areata with triamcinolone acetonide by jet injector. Br J Dermatol 1973;88:55-9. Chu TW, AlJasser M, Alharbi A, Abahussein O, McElwee K, Shapiro J, et al. Benefit of different concentrations of intralesional triamcinolone acetonide in alopecia areata: An intrasubject pilot study. J Am Acad Dermatol 2015;73:338-40. Kar BR, Handa S, Dogra S, Kumar B. Placebo-controlled oral pulse prednisolone therapy in alopecia areata. J Am Acad Dermatol 2005;52:287-90. Agarwal A, Nath J, Barua KN. Twice weekly 5 mg betamethasone oral pulse therapy in the treatment of alopecia areata. J Eur Acad Dermatol Venereol 2006;20:1375-6. Friedli A, Labarthe MP, Engelhardt E, Feldmann R, Salomon D, Saurat JH, et al. Pulse methylprednisolone therapy for severe alopecia areata: An open prospective study of 45 patients. J Am Acad Dermatol 1998;39:597-602. Nakajima T, Inui S, Itami S. Pulse corticosteroid therapy for alopecia areata: Study of 139 patients. Dermatology 2007;215:320-4. Shreberk-Hassidim R, Ramot Y, Gilula Z, Zlotogorski A. A systematic review of pulse steroid therapy for alopecia areata. J Am Acad Dermatol 2016;74:372-40. Joly P. The use of methotrexate alone or in combination with low doses of oral corticosteroids in the treatment of alopecia totalis or universalis. J Am Acad Dermatol 2006;55:632-6. Chartaux E, Joly P. Long-term follow-up of the efficacy of methotrexate alone or in combination with low doses of oral corticosteroids in the treatment of alopecia areata totalis or universalis. Ann Dermatol Venereol 2010;137:507-13. Petukhova L, Duvic M, Hordinsky M, Norris D, Price V, Shimomura Y, et al. Genome-wide association study in alopecia areata implicates both innate and adaptive immunity. Nature 2010;466:113-7. Waldmann TA. The biology of IL-15: Implications for cancer therapy and the treatment of autoimmune disorders. J Investig Dermatol Symp Proc 2013;16:S28-30. Falto-Aizpurua L, Choudhary S, Tosti A. Emerging treatments in alopecia. Expert Opin Emerg Drugs 2014;19:545-56. Divito SJ, Kupper TS. Inhibiting Janus kinases to treat alopecia areata. Nat Med 2014;20:989-90. Craiglow BG, King BA. Killing two birds with one stone: Oral tofacitinib reverses alopecia universalis in a patient with plaque psoriasis. J Invest Dermatol 2014;134:2988-90. Xing L, Dai Z, Jabbari A, Cerise JE, Higgins CA, Gong W, et al. Alopecia areata is driven by cytotoxic T lymphocytes and is reversed by JAK inhibition. Nat Med 2014;20:1043-9. Jabbari A, Dai Z, Xing L, Cerise JE, Ramot Y, Berkun Y, et al. Reversal of alopecia areata following treatment with the JAK1/2 inhibitor baricitinib. EBioMedicine 2015;2:351-5. Craiglow BG, Liu LY, King BA. Tofacitinib for the treatment of alopecia areata and variants in adolescents. J Am Acad Dermatol 2017;76:29-32. Anzengruber F, Maul JT, Kamarachev J, Trüeb RM, French LE, Navarini AA, et al. Transient efficacy of tofacitinib in alopecia areata universalis. Case Rep Dermatol 2016;8:102-6. Brunne V, Mertins G, Reimann G, Brockmeyer NH. Off-label use in dermatological practice. The conflict between professional duty and legal requirements. Hautarzt 2004;55:727-34.